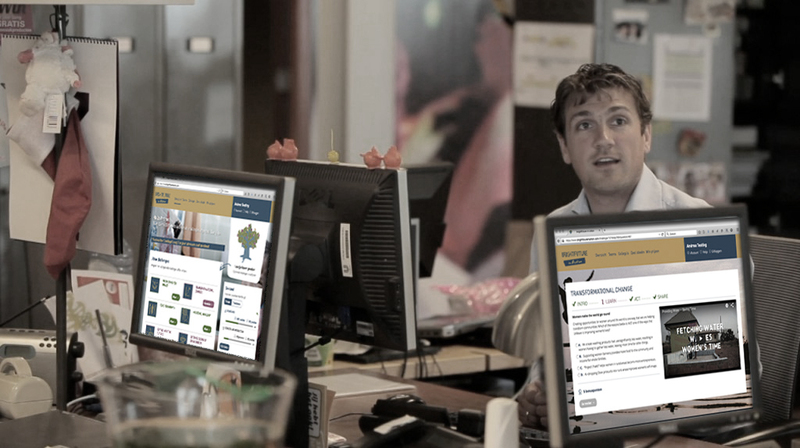 Mid May 2014 Unilever started the European roll-out of its internal engagement tool ‘brightFuture in Action’ in 15 different locations, in eight different languages. After just three days already half of the 5,700 invited employees were actively involved; after six weeks the rate stood at no less than 75%. The deployment follows a very successful introduction at Unilever Benelux in 2013 that proved that more engagement, better understanding, and genuine interaction on sustainability in only six weeks can be done. The programme based on the Flywheel change management method by Snowballs & Flywheels ran at the company in order to engage colleagues for its business model of sustainable growth, the Unilever Sustainable Living Plan (USLP). BrightFuture in Action stems from an internal insight. Although we are already active in USLP, we tend to broadcast and leave little room for interaction. Employees and colleagues really stressed the need for it. It’s a web-based tool to really engage people with our Sustainable Living Plan, to start conversations. It’s a digital suggestion box to give life to our strategy in our organisation”, says Anniek Mauser, Director Sustainability Unilever Benelux. The Flywheel web-based engagement programme was completely customised to fit Unilever’s strategy, goals and look and feel. BrightFuture in Action achieved great results in 2013 in the Benelux. Some 73% of employees participated and generated lasting impact putting in as little as 10 minutes of effort a week. Over the six weeks that the pilot project ran, Unilever employees were invited to participate in six challenges, each consisting of a quiz, an online action and social sharing and discussion on six of our sustainability themes. Each challenge also specifically asked suggestions for improvement and also stimulated participants to mutually interact by delivering feedback on each other’s ideas. After the pilot’s success story Germany, Austria, Switzerland, Greece, Poland, the Baltic states, Romania, the Netherlands—including the Marketing & Innovation HUB Europe—, Czech Republic, Slovakia, Belgium, Hungary & Adria region, Bulgaria, and Serbia followed the Benelux approach. Convinced, not only by the numbers but also based on the positive energy the project generated, the operating companies decided to implement the web-based engagement tool based on the Flywheel method by Snowballs & Flywheels. From a ‘basket’ of twelve challenges, the countries got to choose six which they could fully tailor to their own requirements. The results after six weeks are excellent: some 75% of invitees have actively participated and taken part in over 21,000 challenges in total. Preliminary results of the impact assessment again show powerful results with 70% to 85% of the participants stating the tool helped them understanding how they can contribute to delivering the Sustainable Living Plan in their daily jobs and a large majority actually has changed some of their ways of working as well.